About "The Case for District-Based Reform"
In 1999, under the superintendancy of retired Air Force major general John Fryer, the Duval County (Fla.) school system set out to improve every school in the district. Over the next five years, the district achieved stunning results that have drawn nationwide attention. Supovitz uses the unfolding story of Duval County to develop a sophisticated and thoughtful analysis of the role of the school district in enacting large-scale reform. Drawing on interviews, surveys, and extensive first-hand observation, Supovitz chalks a vivid portrait. The Case for District-Based Reform weaves together seamlessly the account of leadership and change in one district with an investigation of the larger questions associated with this particular approach to school reform. Praise for "The Case for District-Based Reform"
"This is a wise and practical analysis of how school improvement works, at the school and district level. Supovitz shows us the successful practice of instructional leadership in a real setting with real problems and constraints. This is a basic source for anyone interested in large-scale school improvement." 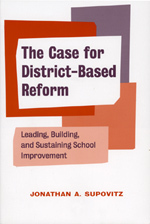 "The Case for District-Based Reform is a wonderful book. I have been working closely with leading school districts in the last decade and Supovitz captures all the key issues. Great, powerful insights, clearly expressed--Supovitz nails the problem and promise of the role of the district in bringing about meaningful, sustainable reform." "The Case for District-Based Reform is a must-read for leaders interested in sustaining long-term district success."